We knew it was coming from the moment we learned 18 months ago that Senator Edward Kennedy had been diagnosed with inoperable brain cancer. We knew it was coming when the Massachusetts Democrat was noticeably absent from the funeral on August 14 of his sister, Eunice Kennedy Shriver, a tireless advocate for the mentally disabled and founder of the Special Olympics, who died four days earlier at the age of 88. And we knew it was coming when it was disclosed by The Boston Globe last week that the senator, fully aware that his passing was imminent, had written to state leaders in his native Massachusetts asking them to change a state law to allow Governor Deval Patrick to make an appointment to fill his seat on an interim basis until a permanent successor is elected 145 days -- five months -- later. Yet when the news of the Massachusetts Democrat's death at age 77 finally broke during the wee hours of Wednesday morning -- too late for the print runs of the nation's daily newspapers save for those on the West Coast -- it nonetheless stunned us all, friend and foe alike. The "Liberal Lion of the Senate" -- whose tireless, lifelong dedication to the cause of economic and social justice for all Americans probably would have earned him the moniker "The Happy Warrior" had a fellow senator and later vice president named Hubert H. Humphrey not claimed it first -- had many doubters in 1962 when he ran for his older brother's vacated Senate seat after John F. Kennedy won the presidency two years earlier. 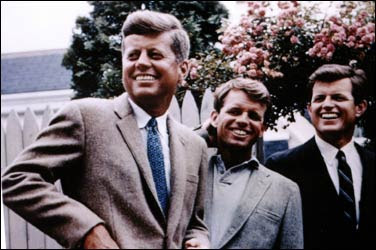 After John was assassinated in 1963 and brother Robert was gunned down while seeking the Democratic presidential nomination in 1968, many believe that Edward -- the youngest of the Kennedy brothers who was universally known by his nickname, Ted -- was thought to be a shoo-in to win the White House himself, despite fears that he, too, would fall victim to an assassin's bullet. As fate would have it, a personal scandal stemming from a 1969 car accident would forever disqualify Ted Kennedy from winning the White House. Yet that turn of events proved to be a blessing in disguise, for in his 46 years in the Senate -- a tenure longer than any other senator in U.S. history except Robert Byrd of West Virginia and Strom Thurmond of South Carolina -- Kennedy gained far greater power and influence than he could likely ever have garnered in four or eight years as president. Yet Kennedy died with his greatest lifelong crusade -- universal health insurance for all Americans -- still unfulfilled and the subject of intense debate, one that has been markedly affected by his absence from the Senate chambers. President Obama, who is vacationing with his wife and children at Martha's Vineyard, near the Kennedy family compound at Hyannisport, issued a statement Wednesday saying he was "heartbroken" by Kennedy's death. "His ideas and ideals are stamped on scores of laws and reflected on millions of lives ... in all who can pursue their dreams in an America that is more equal and more just, including myself," the president said. "The Kennedy name is synonymous with the Democratic Party, and at times Ted was the target of partisan campaign attacks. But in the United States Senate, I can think of no one who engendered greater respect or affection from members of both sides of the aisle," Obama continued. In many ways, the president owes much of his election victory to Kennedy, whose ringing endorsement last year of the then-senator from Illinois in the race for the Democratic nomination against fellow senator and former first lady Hillary Clinton was seen by many as the symbolic passing of the political torch carried by the Kennedys to a new generation. The president will deliver the eulogy at a funeral Mass for the senator scheduled for Saturday in Boston. The senator's remains will later be flown to Washington for burial alongside his assassinated brothers at Arlington National Cemetery. Both the funeral Mass and burial service are scheduled to be closed to the public. However, the senator's body will lie in repose for public viewing at the John F. Kennedy Presidential Library at Dorchester, a Boston suburb, on Friday from 10:00 a.m. to 4:00 p.m. EDT, followed by a 7:00 p.m. EDT memorial service Friday night at the library. The two-hour memorial service will also be closed to the public, due to space limitations, but is likely to be televised live. Edward Moore Kennedy was born at St. Margaret's Hospital in Boston on February 22, 1932, the youngest of nine children of Joseph P. Kennedy, Sr. and Rose Fitzgerald, who were both members of two of the most prominent Irish-American families in the city. Ironically, his older brother John, according to The Boston Globe's obituary published in today's (Thursday's) editions, asked that he be named the newborn's godfather and that the baby be named George Washington Kennedy, in honor of the nation's first president. His parents said yes to John's first request, but no to the second. Frequently uprooted as a child as the Kennedys moved several times -- to Bronxville, New York; Hyannisport, Massachusetts; Palm Beach, Florida and to London while his father served as the U.S. Ambassador to Britain -- the young Kennedy attended ten different schools by the age of eleven. Kennedy's life was marked repeatedly by family tragedies, even as a child. Between the ages of eight and 16, Ted endured the trauma of his sister Rosemary's lobotomy in her early 20s that left her incapacitated for the rest of her life, along with the deaths of his brother Joseph P. Kennedy, Jr. during World War II and his sister Kathleen Agnes Kennedy in a plane crash in 1948. It was a family "curse" that would continue for decades, including the assassinations of his brothers John and Robert in the 1960s, the death of his nephew, John F. Kennedy, Jr. in a plane crash in 1999 and most recently the passing of his sister Eunice earlier this month. Yet through it all, Ted Kennedy soldiered on as the patriarch of a clan that for a generation was the closest thing America had to a royal family. When his older brother John won the presidency in 1960, Ted was eager to succeed him in the U.S. Senate, but because of his age -- he was a year younger than the constitutionally-mandated minimum of 30 to be eligible to run -- he was forced to wait two years until a special election in 1962. Kennedy's quest for the Senate was an uphill battle all the way. He first faced a Democratic Party primary challenge from Massachusetts Attorney general Ed McCormack. McCormack had the support of many liberals and intellectuals, who thought Kennedy was too inexperienced and whose expulsion from Harvard University in a cheating scandal became an issue during the race. Kennedy also had to confront the widely-held notion that with one brother in the White House as president and another serving as attorney general, "Don't you think that Teddy is one Kennedy too many?" But Kennedy turned out to be a tough campaigner. In a televised debate, McCormack said "The office of United States senator should be merited, and not inherited," and said that if his opponent's name was Edward Moore rather than Edward Moore Kennedy, his candidacy "would be a joke." That didn't sit well with viewers, who thought McCormack's debate performance was overbearing; combined with the family political machine fully behind him, Kennedy won the September 1962 primary by a two-to-one margin. In the November special election, Kennedy defeated Republican George Cabot Lodge II, the son of former Senator Henry Cabot Lodge Jr., who gave up his seat to be Richard Nixon's vice-presidential running mate in the 1960 election. Throughout his 46 years in the Senate, Kennedy was a tireless champion for civil rights. With fellow Senator Hubert H. Humphrey as his mentor -- the "Happy Warrior" from Minnesota challenged the Democratic Party as early as its 1948 convention to adopt a civil-rights platform to end segregation and discrimination against African-Americans in the South -- Kennedy adopted as his own Humphrey's steadfast belief that "the best measure of government is how it treats its children, its elderly and the sick and needy who cannot take care of themselves." Kennedy regarded civil rights as "America's great unfinished business" and over the years, he sponsored or co-sponsored one civil rights bill after another, most recently the Lily Ledbetter Equal Pay Act -- the first piece of legislation signed into law by Obama in January -- that expands workers’ rights to sue over unequal pay. Kennedy was also a co-sponsor of the proposed Employment Non-Discrimination Act, which would extend the provisions of the Civil Rights Act of 1964 to ban anti-gay discrimination in employment. He was also a fierce opponent of anyone he perceived as a threat to Americans' civil rights and civil liberties, blocking the 1987 confirmation of Robert Bork to the U.S. Supreme Court, whose views on civil rights were considered too extreme even for some conservatives. He was less successful, however, in blocking the Supreme Court confirmations of conservatives Clarence Thomas, Antonin Scalia and, more recently, Samuel Alito and Chief Justice John Roberts. Having come from a family that has been plagued by tragedies, it was perhaps inevitable that Ted Kennedy would suffer a personal tragedy himself, when in July 0f 1969 -- just days after the nation celebrated the Apollo 11 moon landing -- Kennedy drove his car off a bridge on Chappaquiddick Island, Massachusetts, plunging into a tidal channel. Mary Jo Kopechne, a former campaign worker for Kennedy's late brother Robert, was a passenger in the senator's car. Kennedy was able to escape the vehicle, but Kopechne wasn't and she drowned. After Kopechne's body was found, Kennedy gave a statement to police saying that he had taken a wrong turn and accidentally drove his car off the bridge. Later, he pleaded guilty to a charge of leaving the scene of an accident after causing injury and received a suspended sentence. The incident became a national scandal and forever foreclosed Kennedy from becoming president -- a fact that was driven home to him in 1980 when he ran for the Democratic nomination against incumbent President Jimmy Carter. Despite Carter's own unpopularity, the president easily defeated Kennedy. But many of Kennedy's supporters refused to back Carter in the general election and he ultimately lost to Ronald Reagan. But while America made it clear that it didn't want to send Kennedy to the Oval Office because of Chappaquiddick, Massachusetts voters were much more forgiving of their senior senator and re-elected him seven times. And it proved liberating to Kennedy family patriarch. Freed from the political constraints that the presidency places on whomever occupies that office, Kennedy was able to accomplish far more of what he sought out to do in the Senate. But the one thing that Kennedy was most passionate about -- and dedicated his entire public life to achieving -- remains unfulfilled with his death: Universal health insurance for all Americans. Nonetheless, Kennedy did succeed in increasing funding for cancer research (long before his own cancer was diagnosed), expanding the State Children's Health Insurance Plan (SCHIP), tighter regulation of private health-maintenance organizations, or HMOs and greater portability for workers' health insurance. Already, Kennedy's death has spawned a rallying cry for supporters of health-care reform: "Do It for Teddy!" At least one blogger, Balloon Juice's Anne Laurie, has called for reform legislation to bear Kennedy's name -- a lasting tribute to the man who dramatically called health-care reform "the cause of my life" in a stirring speech at last year's Democratic Convention in Denver. How will Ted Kennedy's passing ultimately affect the often-acrimonious debate? Only time will tell.